One of the greatest aspects of my work is helping people realise a vision. For this project, a bare paddock was transformed into a stunning garden, in preparation for a beautiful country wedding. 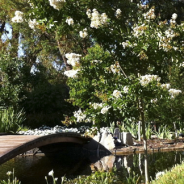 I had a wonderful time at the recent WALDA Landscape Design Awards at Matilda Bay- lovely food and jazz music, catching up with friends and colleagues by the beautiful Swan river- and I was lucky enough to win an award for one of my favourite gardens – The Gidgegannup project! 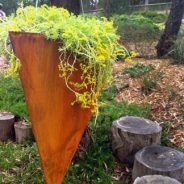 Designfest is a spectacular splash of gorgeous gardens held every second year in Melbourne. On Sunday the 17th March, I will be helping to present some of the highlights at a WALDA event. Come along and celebrate St. Patrick’s Day with some stunning greenery! 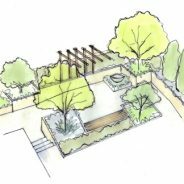 This is a perspective sketch of a garden I am currently working on. It will help my clients visualise the area which is not easy to do from a 2D plan view. The concept resolves a tricky area where the land is sloping off in different directions. 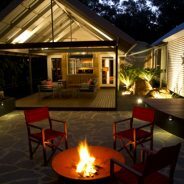 In March last year I posted my design concept for a Gidgegannup property with lake views. I recently went to visit Michelle and Rod, to see their completed garden. 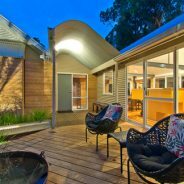 It is almost a year since I did the design for their place and it has now been built by Grassroots Exteriors. They are very happy and it has given them the chance to get outside and enjoy the beautiful trees and nature surrounding them. In this small garden I made use of some interesting angles to maximise the space. 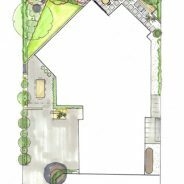 The triangular lawn and raised beds at the back add some shape and interest to what would otherwise have been a confining area, dominated by the two storey home. Read on to see what the clients said.